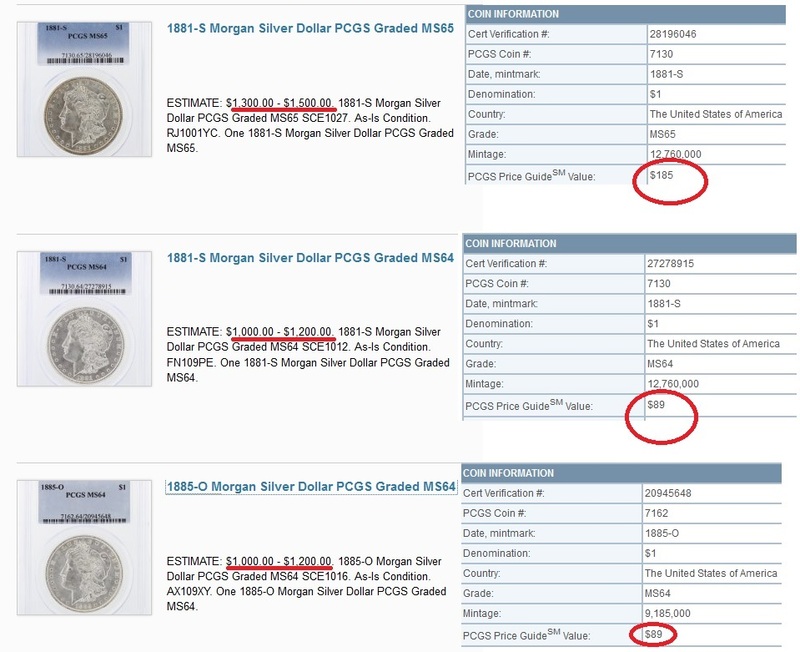 Click to expand screenshot to see hyped values against PCGS retail prices–for exact coins! 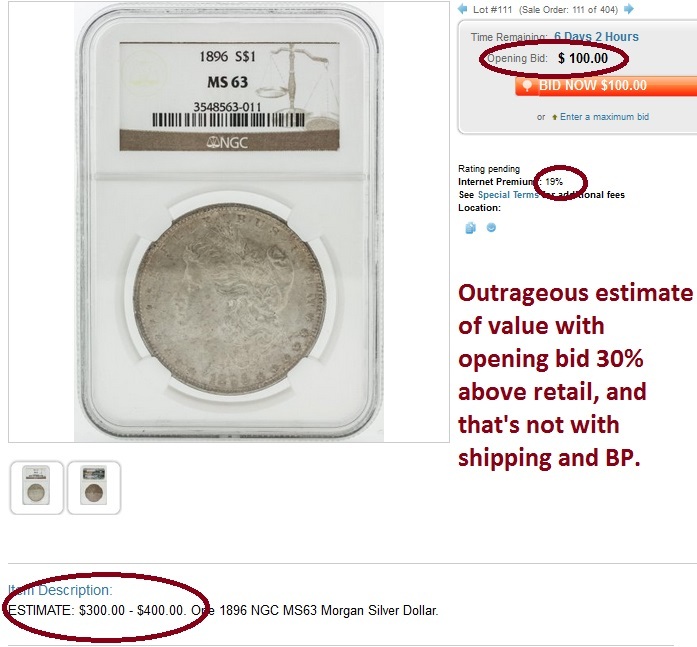 This Proxibid auction house specializing in coins continues to inflate values without regard to accuracy, a sure way to erode trust in the online world. 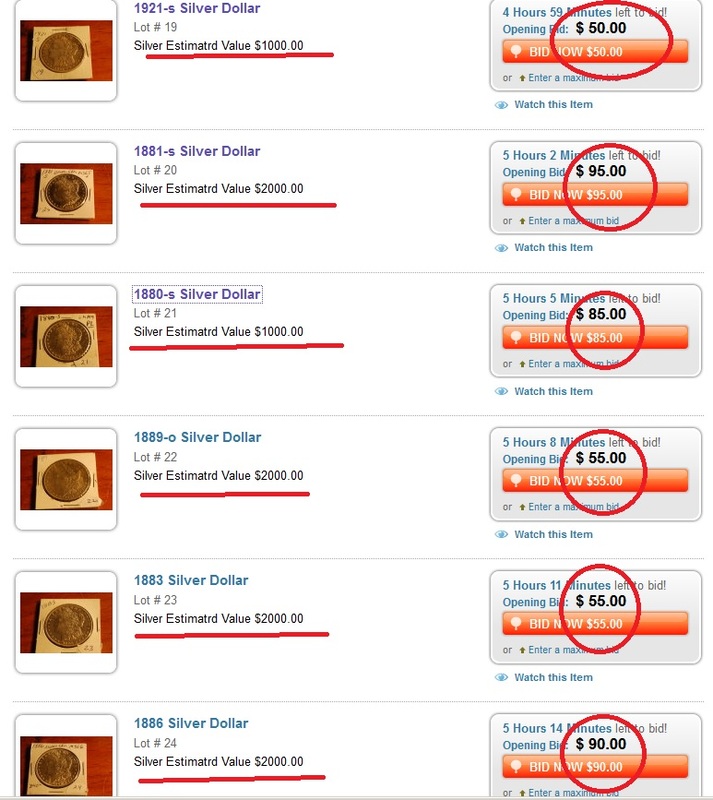 The samples above grossly inflate values for common Morgan dollars. 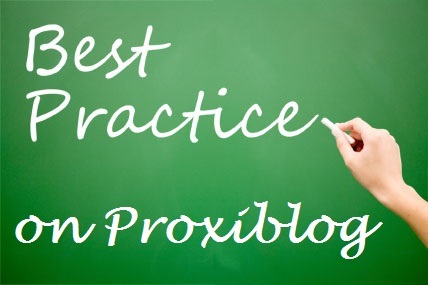 We will continue to call attention to these inaccuracies in the hope that our viewers will report them and Proxibid will alter the Unified User Agreement. 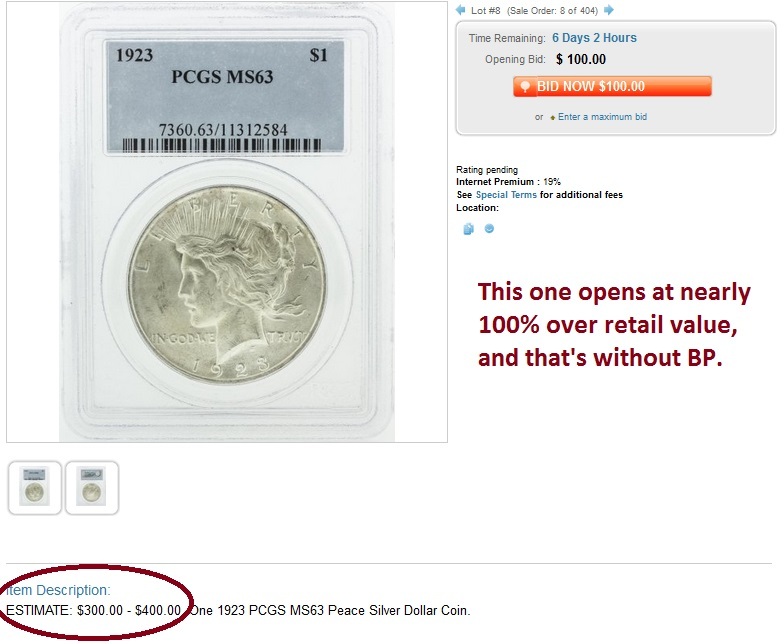 Whenever you see slabbed coins from major houses–PCGS, NGC, ANACS, ICG–you can always check the real retail value. 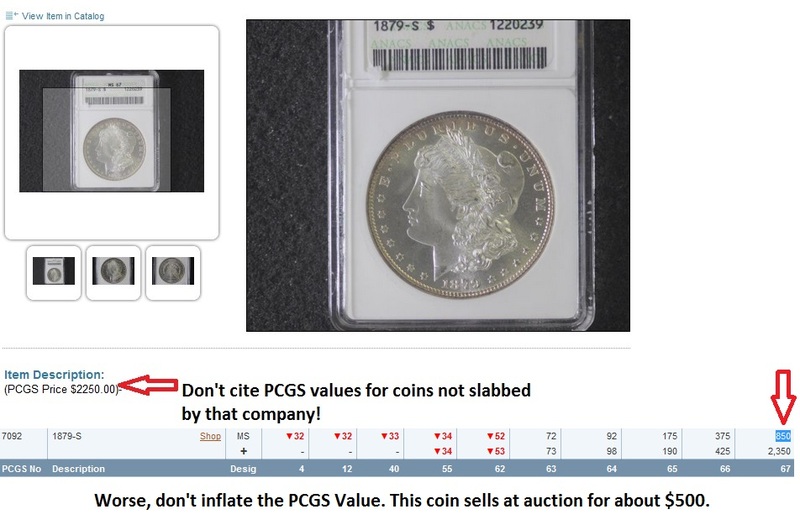 Just copy down the certification number for PCGS and NGC lots and then visit their retail value database for the exact coin being offered on Proxibid. For PCGS, click here. 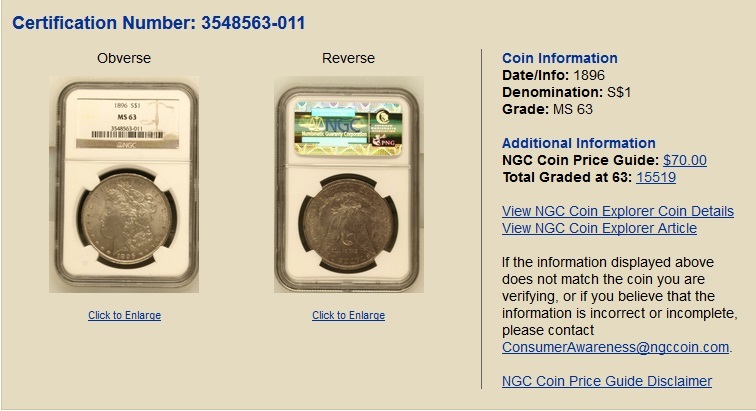 For NGC, click here. You’re always free to do as you like, but we will never EVER bid in auctions like the one above. We just assume if companies are going to be inaccurate about easily checked values, they might not be as mindful about other buyer concerns, such as shipping or customer service. Once an auction house decides to go this route, it can take months or years to regain the online bidder’s trust. And trust is the brand of Proxibid hosting houses like this. Better to set down some house rules in the Unified User Agreement about grossly inflating values and penalize auction companies that are informed but choose to ignore readily available retail values–in the case above, for the exact coins being offered on the portal. If you agree, whenever you see inflated values, use “the report this item” link that Proxibid provides for cases like this and inform Proxibid’s quality control. Recently we bid on two auctions on the same day. 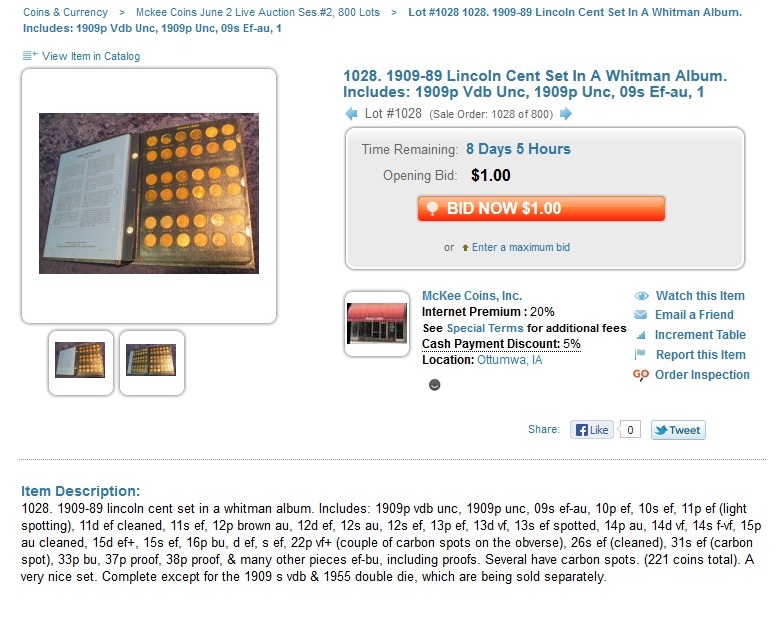 One, Tangible Investments, was a joy to see and read, with numismatic lot descriptions graced by fine, expandable photos. 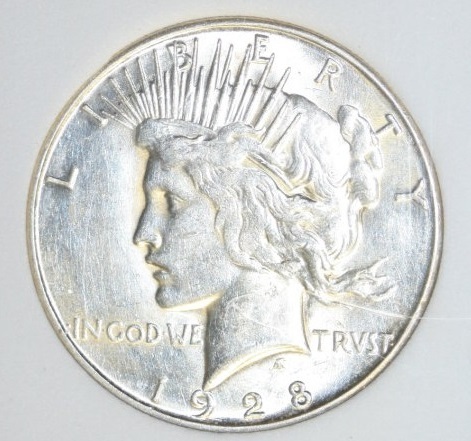 The other, which we won’t name, made several numismatic mistakes. In sum, one house lured us, the other lost our interest. 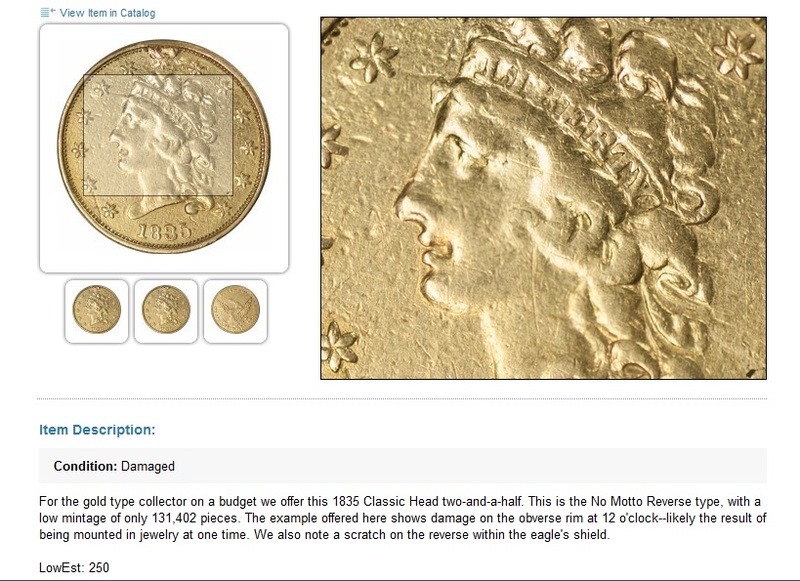 The description uses Greysheet low estimate, cites mintage and denomination (including variety), and notes damage, a previous mounting and scratch–plus provides multiple views of the coin. It doesn’t get much better than this on Proxibid. Now take a look at a series of lot descriptions that, frankly, irked us to the point that we stopped bidding. 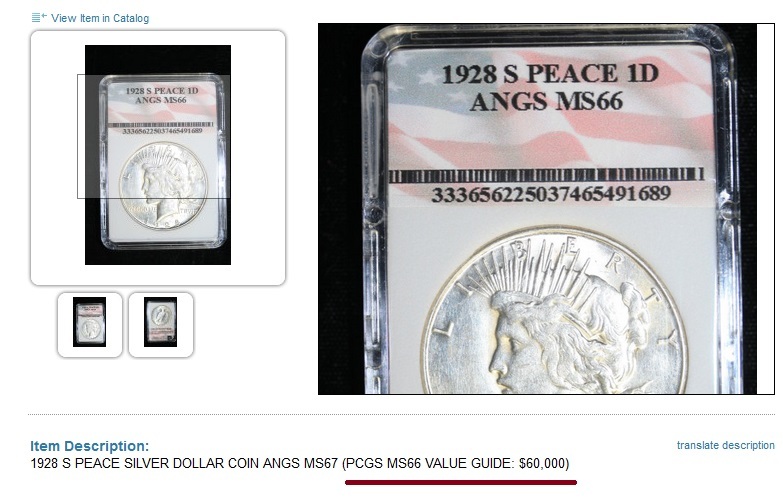 This overstates PCGS values for an ANACS coin. 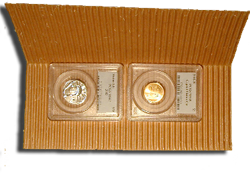 The value does not apply as both companies have different grading standards. Also, the Proxibid auction company inflates the PCGS value, again as the retail price index documents. 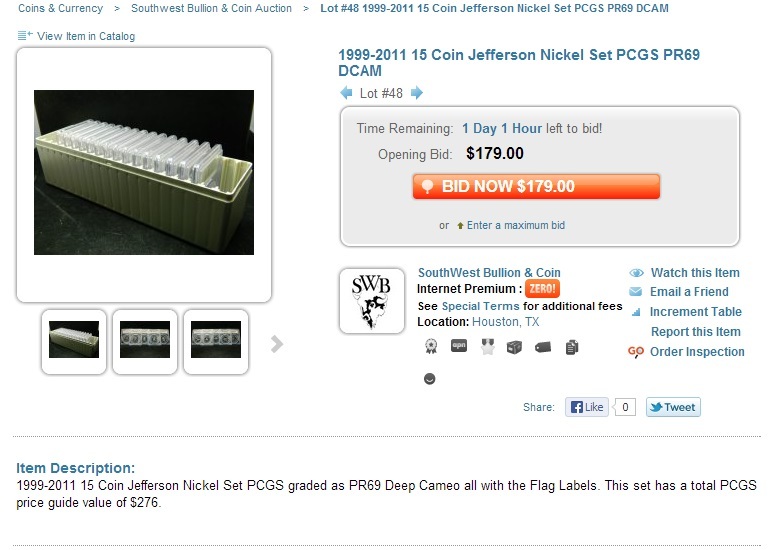 Multiple numismatic errors irk us to the point where we almost stopped bidding. This lot description does the same as above, overstating and misapplying values. 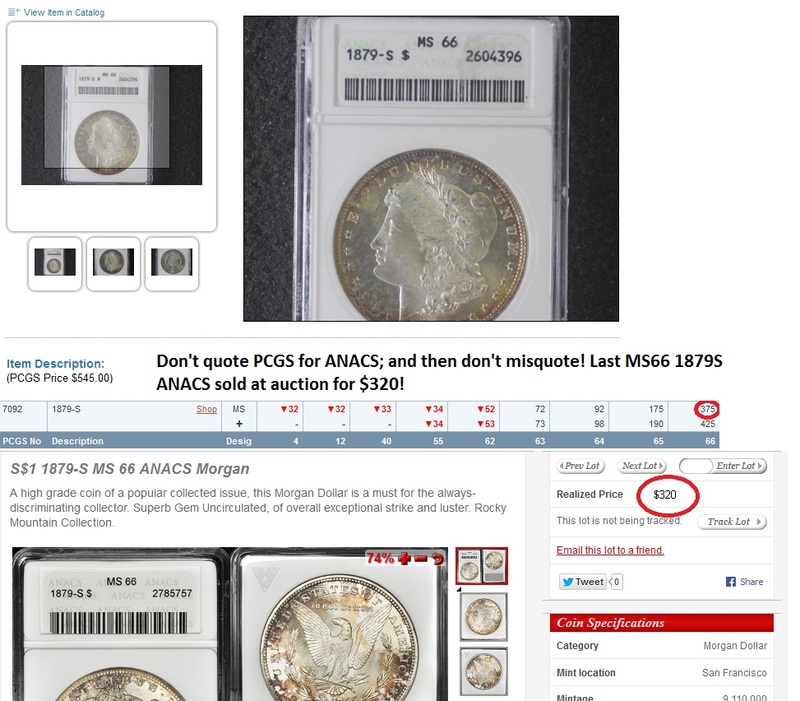 Moreover, using PCGS CoinFacts, you can see precisely how much a similar ANACS coin sold for at a recent auction. 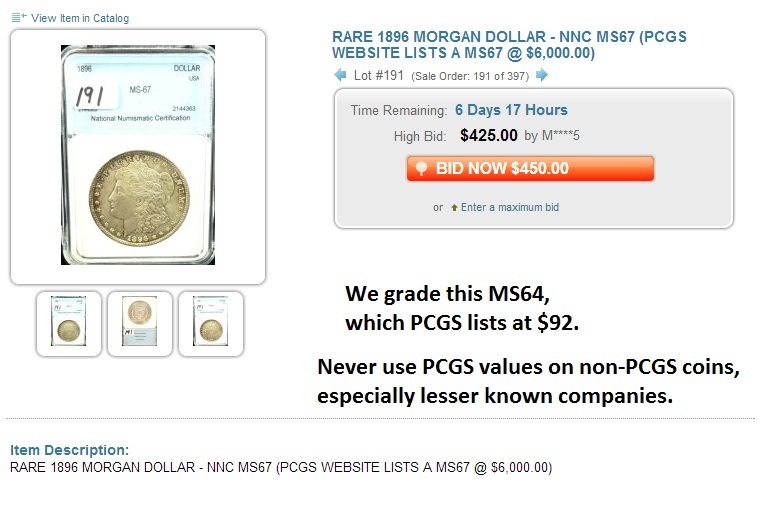 We stopped bidding when the auction house covered the PCGS certification number of an expensive key date 1893-S. Never buy a pricey coin without verifying the PCGS certification number with this link. 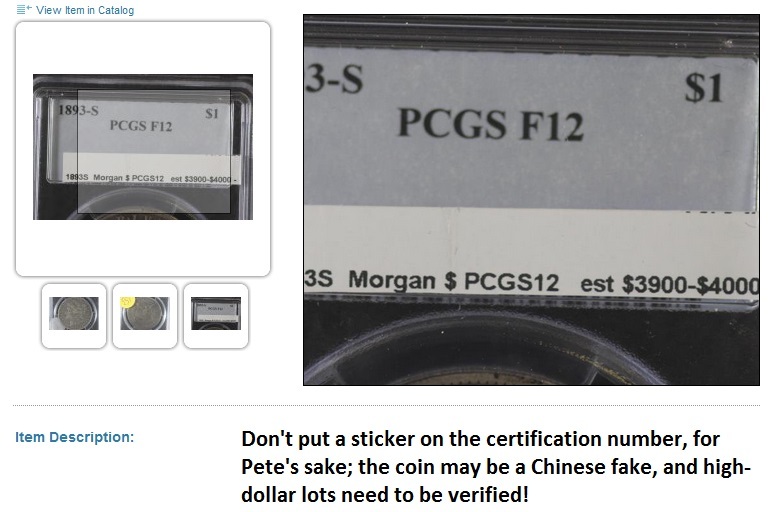 Because the auction house has gotten into the habit of covering certification numbers with its promotional stickers, instead of using Proxibid lot technology, we don’t know if this is an authentic key date Morgan. 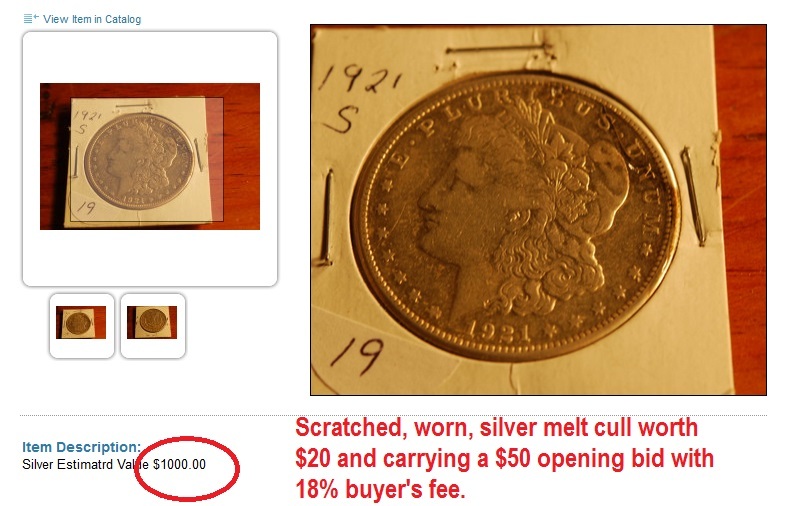 Most knowing bidders willing to spend high-dollar amounts for pricey coins usually know the ropes. Don’t hang yourself with hype. The best way to move lots and spark bidding is to shoot a sharp photo. 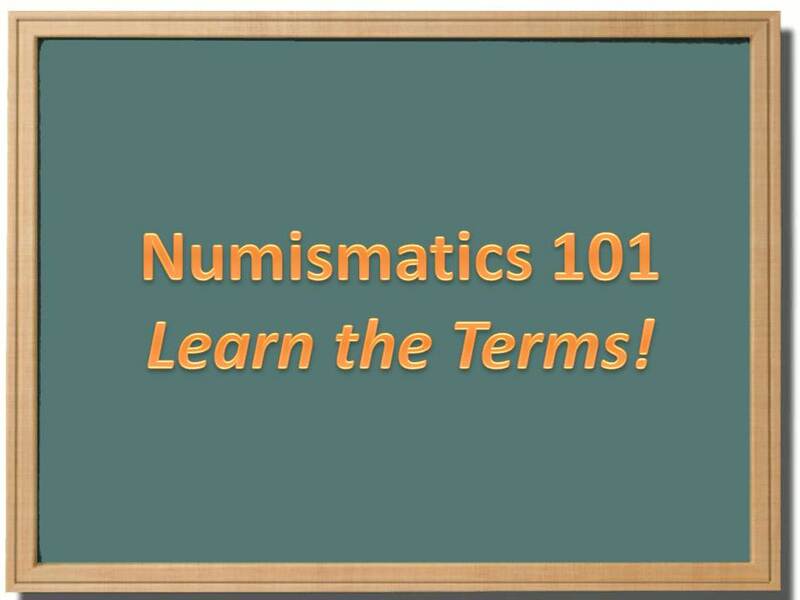 The next best way is to describe the lot numismatically. 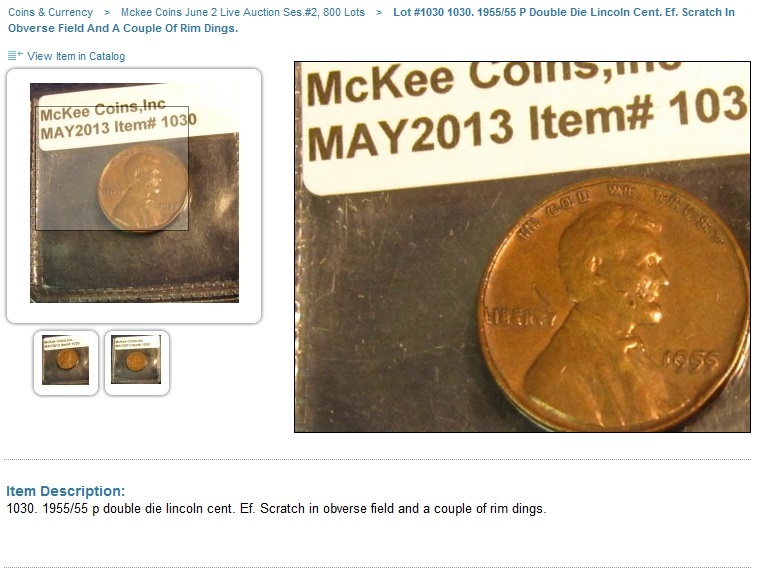 McKee also describes flaws in lots so that bidders know the true condition of a coin, as in this photo of a rare 1955 double die that has a scratch and rim dings and hence probably will not slab. 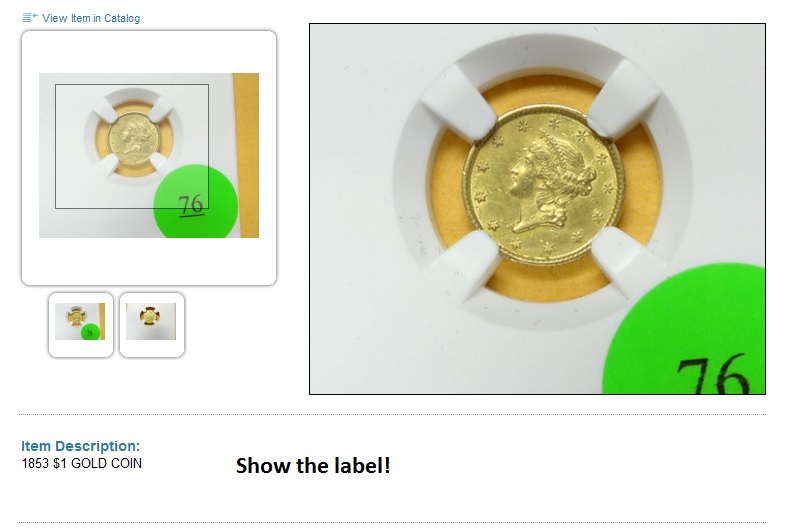 Speaking of slabs, here is a coin in one whose auctioneer shows neither the label nor describes the lot, meaning that buyers can be bidding on a flawed coin (probably improperly cleaned). Auctioneers who know numismatic terms attract repeat business. Buyers who are shortchanged will learn the truth sooner or later when attempting to resell their overpriced lots.